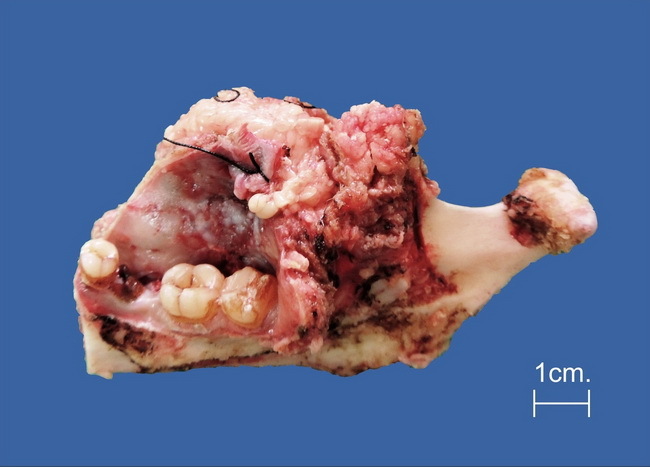 Hemi-mandibulectomy specimen from a 30 y/o male with long-standing history of chewing tobacco and betel nut (a practice common in parts of South Asia). He presented with an ulcer on the gingivo-buccal mucosa with an associated 4 cm nodular mass which caused visible swelling of his cheek. A biopsy of the ulcerated lesion revealed infiltrating squamous cell carcinoma. Case contributed by: Dr. Sanjay D. Deshmukh and Dr. A.R.Joshi, Department of Pathology, Smt. Kashibai Navale Medical college, Pune ,INDIA.